This isn’t your ordinary barbecue class! When you choose to attend this barbecue class or any of our OnCue Consulting programs, you’re benefiting from over 30 years of barbecue experience. Our team works consciously every day to remain on lists such as 33 Best BBQ in America by Thrillist and 50 Best BBQ Joints via MSN. We’ve been working hard on a lot of new content for next week’s Catering Master Class. One topic that’s totally changed is social media. The algorithms and the rules of the game — and it IS a game — have completely changed this year. That means that in order to be successful, you have to be strategic. I’m going to share my thought process and what’s working for us right now. 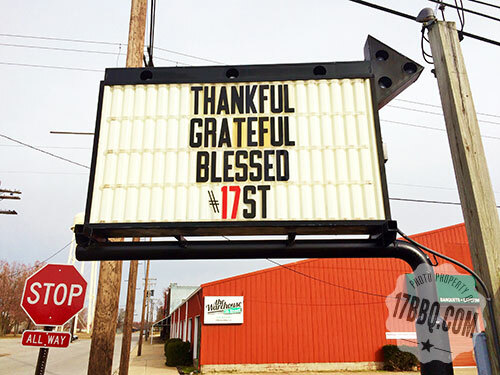 Words we live by at 17th Street Barbecue. Our restaurant signs have become points of interest and photographed and shared across the world. Please tag us on Twitter, Instagram, or Facebook so we can see how far they travel! Follow our adventures in real time on Instagram and Twitter. See lots of entertaining and barbecue ideas on our Pinterest boards. And we post fun things on Facebook, too! © 2019 17th Street Barbecue. Please don't swipe these images. If you ask permission, we almost always say yes. Karma!